On Tuesday we hosted a Skypecast with Seth Godin, TypePad blogger and author of the new book Small is the New Big. If you missed the Skypecast, you can listen to our conversation here, or you can grab the 14mb MP3 file directly. This is our second TypePad podcast; if you're interested in subscribing to our amateur radio experiments in iTunes or another favorite audio player, you can grab an RSS feed of just our podcasts from our friends at Odeo. You might know that we recently added support for Technorati Tags to TypePad, but what you might not know is that thanks to the Six Apart Update Stream we deliver your posts directly to the team at Technorati. If you've set your blog to be publicized, you've got a direct connection to the most popular blog search service, and we make sure your TypePad blog gets priority handling on the way to rest of the web. To help show you how this actually works, we've put together a short documentary that gives you a "behind the scenes" look into how we deliver posts to Technorati. Enjoy! 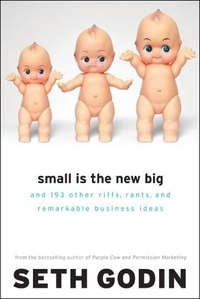 Seth Godin, author of Small is the New Big, has a mission -- to help business people realize how smart they already are. He writes and talks relentlessly about the need to engage customers, to make your products or services remarkable, discussion-worthy, and to make sure your business ultimately keeps (and exceeds) its promises. Chances are you've heard Godin's message before -- he blogs (on TypePad), he speaks, he writes books. He founded the pionieering online marketing firm Yoyodyne and, most recently, the expertise portal Squidoo. His previous books include Permisison Marketing, Unleashing the Ideavirus, and All Marketers are Liars. On Tuesday, August 22nd at 2:00 pm (PST) we'll be hosting a moderated Skypecast discussion with Seth Godin. To participate, all you need is Skype and this link: skypecasts.skype.com. If you can't join us, we'll be recording the conversation and releasing it as a podcast later next week. Today we're excited to announce the release of TypePad Mobile, a free application for your Palm, Windows Mobile or Symbian Series 60 smartphone that lets you post photos and entries to your TypePad blogs and photo albums with just a few clicks. It's just the latest step in our goal to support blogging from wherever, whenever. TypePad Mobile comes from Six Apart's acquisition of SplashBlog. The Splash team has years of experience developing easy to use mobile applications, and we're excited to have them be delivering smartphone applications designed specifically to work with TypePad. If you have a TypePad blog and a smartphone that runs Palm OS 5, Windows Mobile 5, or Symbian Series 60, check out screenshots and download the application that fits your phone. Or visit http://get.typepad.com/from your smartphone to install it directly to your device. If you're curious, you can also read the TypePad Mobile User Guide in our (freshly redesigned) Knowledge Base.